Celebrate Bike Month with Events in these Levitt Cities! Across the country, people are keeping fit, saving time and exploring their local communities by biking! May is National Bike Month and to celebrate, numerous cities and bicycling advocacy organizations are hosting events, encouraging community members to ride the streets. Here are some events that are happening in cities with permanent or developing Levitt venue to keep bikers at all experience levels moving! Tired of traffic jams? Ride your bike to work in Houston, where advocacy organization Bike Houston works with city government to open up streets and organize group rides for bicyclists. 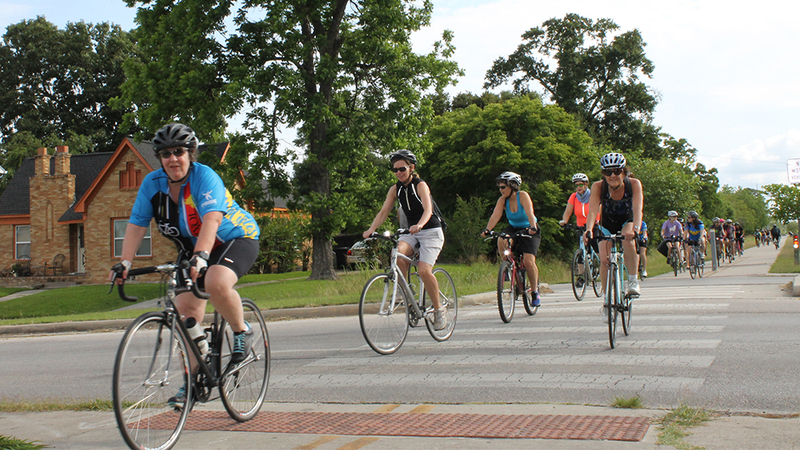 While Bike Month events in the future home of Levitt Pavilion Houston are scheduled for almost every week of May, the city will lead a celebratory ride through its downtown district on May 20—National Bike to Work Day. NASA is even getting in on the cycling fun on May 19 by leading group rides around the Johnson Space Center and treating bicyclists to raffle prizes and giveaways. Bicyclists from the City of Angels can enjoy food and live entertainment at the annual Bike Night happening on May 27 at Union Station—a bike-able distance away from Levitt Pavilion Los Angeles in MacArthur Park. Metro, the city’s public transportation agency, has invited Afro-Latin funk band Jungle Fire (who performed at Levitt Pasadena in 2013) and senior-year fashion students from Otis College of Art and Design to showcase their talents for a night of free music and fashionable bike wear. The event culminates a month of activities for cyclists, including the popular CicLAvia, an open streets event that encourages active transportation in Los Angeles, happening in Southeast LA County on May 15. Having earned a Bronze Bicycle Friendly Community award from the League of American Bicyclists—national sponsor of Bike Month—in 2015, it’s no wonder that the River City and local organizations engage residents in active transportation initiatives. The Community Development Council of Greater Memphis does this through workshops called Pizza with Planners, inviting residents to enjoy a discussion and pizza with neighborhood planners. In honor of Bike Month, the CD Council is inviting residents to ride Memphis’ brand new protected bike lane called the Hampline on May 23, ending their journey with pizza at Overton Park, home to the Levitt Shell. In these cities and more, gather up some family and friends to enjoy the local sights of your neighborhood! Don’t know how to ride a bike? Check out the League of American Bicyclists’ website for cycling classes happening in your area so that you can get moving during Bike Month! This entry was posted in Placemaking and tagged National Bike Month on May 13, 2016 by Lucy Truong.